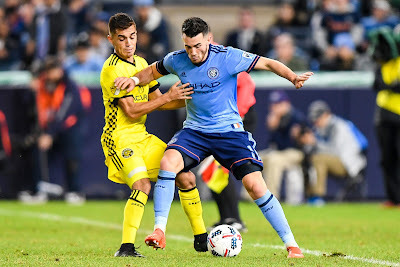 NYCFC's Jack Harrison gains position on Columbus' Hector Jimenez. USA Today Sports. New York City Football Club and the Red Bulls came up one goal short of advancing in their Eastern Conference Semifinal second legs on Sunday. NYCFC lost to Columbus 4-1 last Tuesday night, and they won on Sunday at Yankee Stadium 2-0. Columbus won on aggregate 4-3. The Red Bulls lost 2-1 to Toronto FC last Monday at home, and won 1-0 on Sunday in Toronto to even the aggregate at 2-2. Toronto moves on by virtue of the road goal rule, as they had two road goals in the first leg. Bradley Wright-Phillips scored the Red Bulls' goal on Sunday in the 53rd minute. NYCFC came out firing, and dominated play in the Columbus zone. In the 16th minute, Josh Williams took down Rodney Wallace in the box, and NYCFC was awarded a penalty kick. David Villa took it, and buried it with a kick to the right-center side of the net to make it 1-0. Columbus had a big chance in the 29th minute, when Ola Kamara received a long ball and was in alone. NYCFC goalkeeper Sean Johnson kicked it away with his right leg. In the second half, 53rd minute, NYCFC's Andraz Struna came down the right side, and fired a shot in the box. It ricocheted off the shin of a Columbus defender and into the net to make it 2-0 NYCFC. Most importantly, it gave them 40 minutes to get the tying goal in this one and the winning one in aggregate, as they lost 4-1 in Columbus last Tuesday and had the tie-breaking road goal. In the 66th minute, NYCFC forward Jack Harrison came in down the right side from the center line and got off a solid chance, but Columbus goakeeper Zack Steffen. In the 70th minute, Rodney Wallace had a perfect look and rung one off the left post. Andrea Pirlo, in what is his last game with NYCFC and most likely final appearance ever, came on in the 90th minute. Pirlo played in just 15 games this season, with no goals and two assists, so this was a rather surprising move. Pirlo had a couple chances to drop a long pass into the box in extra time, and both times, they overshot the end line, resulting in a free kick for the Columbus goalkeeper Steffen. Vieira was critical of the referees letting Steffen take as much time as he needed making those kicks, basically stalling to kill of the five minutes of extra time. The fact there was no apparent reason for so long an extra time was not addressed by Vieira. The game ended with a Steffen free kick, and as it came down in the center of the field, the whistle blew and the celebration was on for Columbus. Mullin: "Our big focus is defense"